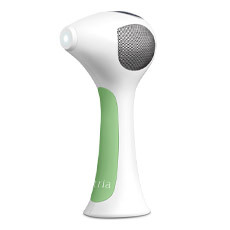 Our Tria hair removal lasers feature the same core diode technology preferred by professional Dermatologists. This technology is proven to be more effective for permanent hair removal results compared to Intense Pulsed Light (IPL) technology. Our lasers disable the hair follicles by targeting the colour pigment at the root. *You could enjoy smooth permanently hair-free skin. WHAT IS THE DIFFERENCE BETWEEN LASER AND IPL TECHNOLOGY? hair removal solution, whereas IPL offers permanent hair reduction. *The laser’s energy is targeted directly to the hair follicle, achieving accurate, permanent results, as the Diode Laser’s specific wavelength is optimised for permanent hair removal. Only a small percentage of IPL’s diffused energy is effectively absorbed by the hair follicle to achieve hair reduction, with ongoing top-up treatments being needed. Follow these 3 simple steps to achieve silky smooth skin. You’re one pulse away from smooth skin. After each pulse, lift and place the tip in an overlapping pattern. *After 12 weeks you could enjoy the freedom of smooth permanently hair-free skin. 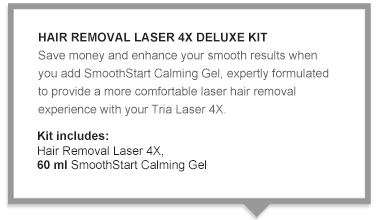 ARE TRIA HAIR REMOVAL LASERS SUITABLE FOR ME? Tria lasers are not suitable for all skin and hair tones. Use this chart to determine if our lasers will work for you. the beauty of technology at its best. and Hair Removal Laser Precision. We’re confident that you’re going to LOVE your new smooth skin, so we offer an exclusive 60 day money-back guarantee only at Triabeauty.co.uk. If you’re not happy with your permanent results, send your device back for a full refund.